I’m just a bit fanatical when it comes to teaching kids to garden. Just think about it…it’s the perfect learning experience and time to “plant” God’s word into your child’s heart. It’s a great time of year to plant a little garden (indoor or out)…for those itching to get the Spring started early! Grandparents, this is a GREAT time for you to connect with your grandkids…especially if Mom and Dad are super busy! Make it easy ~ In this day and age of busyness we want NEED simple and easy! Easy seeds to grow, easy gardens to tend and easy to gather supplies. 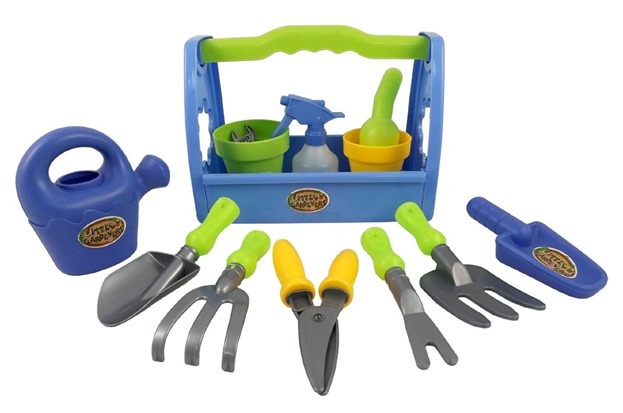 Purchase child size plastic garden tools so that the kids have their very own. Even if you plant a small seed indoors, kids can become familiar with what each little tool does. Don’t get overwhelmed by the thought of a garden. A “garden” can be 1 seed in 1 container on 1 windowsill of your home! There you have it…an indoor garden. You can plant a seed in any kind of container you like; buckets, boots, milk cartons, 2 liter pop bottles…anything! The main thing you need to have is some drainage on the bottom so that over watering does not occur. If the container you use doesn’t already have holes, make them. Seeds that grow super easy indoors are Beans, Radishes, Onions, Peas, Sweet Alyssum, Nasturtiums, Parsley, Sweet Peas. Just to name a few! 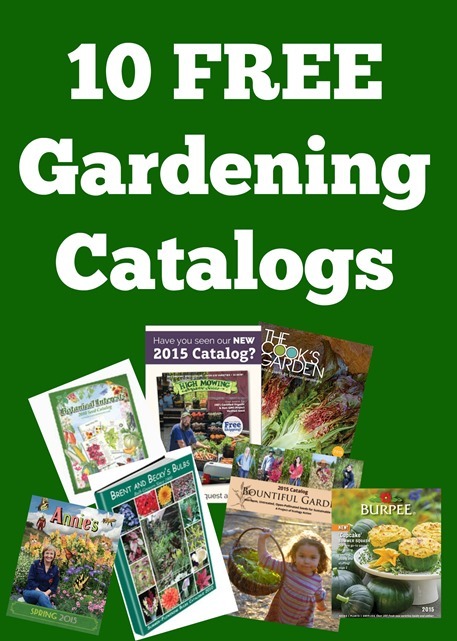 If you can’t find many seed varieties in your local store’s, then order from one of these free catalogs! If you have an indoor garden, make sure that you pick a spot in your house that will get at least 6-8 hours of sunlight. If you don’t have this, there are special growing light bulbs you can buy at your local garden nursery. Be sure and do the above things together! Planning a garden is a big part of the fun. See how easy a little garden can be? Let’s further investigate the reasons having a garden with your child is such an awesome thing. Creates a sense of self confidence and self reliance ~ Kids need to know how to grow their own food. Just think…one of the reasons people are starving in some parts of the world is simply because they do no know how to plant a garden! Truly sad! Stimulates the senses with wonderful smells. Not to mention the fun of digging in dirt! Kids become curious and start to ask many “scientific” questions: How does the seed grow? How long will it take? How can we make it grow faster? Parent and child bonding will happen when doing a fun project together and investigating the wonders of that little seed that is underground. Use your own sense of wonder Mom and Dad! 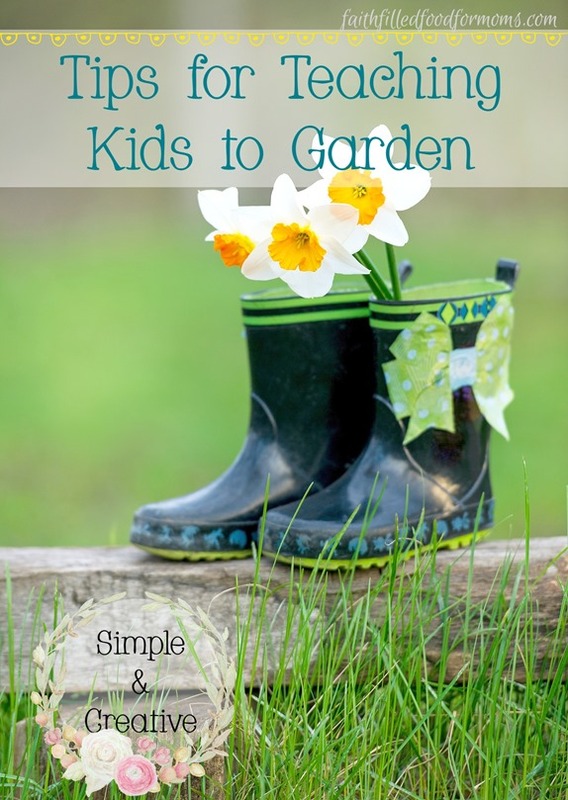 There is no end to the little garden projects you can do with kids, here are just a few! Plant grass in the shape of your child’s handprint ~ super easy and grass grows fast. Seed Sorting ~ Buy different sizes of seeds and sort them, glue them into pictures and then plant the leftovers. This kit is super fun! Kids can see the roots growing and get a better understanding of what’s going on underneath the soil…in that secret place! We’ve done this for our home school and it’s super fun! 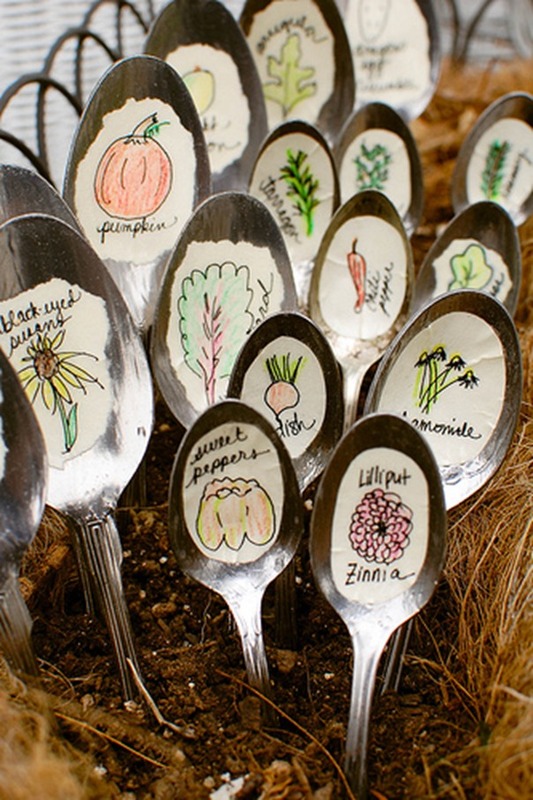 Create little garden markers (even if you plant one seed) out of popsicle sticks or use old spoons! Create a little chart to keep track of the day you last watered your seeds. Then make a chart for when your seed starts to grow. Measure each week out big it is growing. 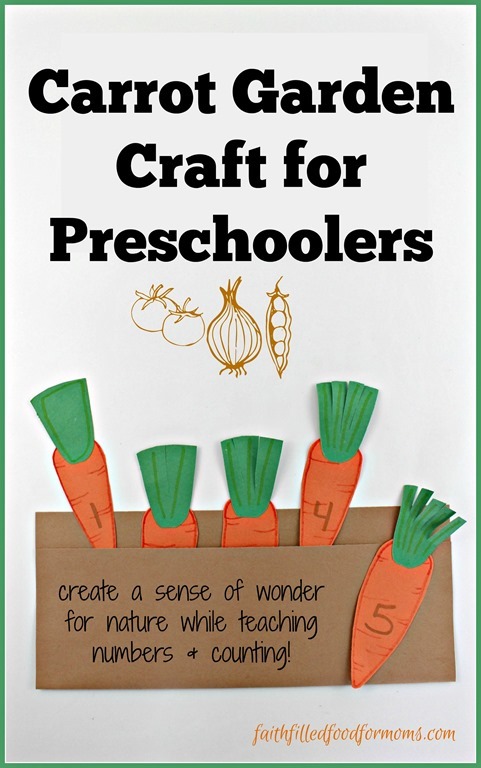 Gather free catalogs and cut out the pictures, sort by whether they are flowers or vegetables. Glue them into a little notebook. Don’t have great weather yet? Start a garden inside…a paper garden! 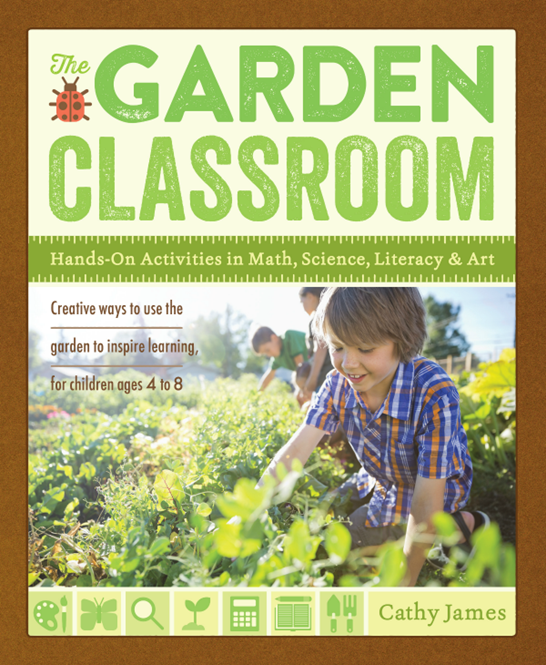 I LOVE this little book: The Garden Classroom! TONS of ideas and hand-on activities in Math, Science, Literacy and Art…PLUS recipes! So fun! Teaching patience is hard to teach children. With gardening, you can be doing other fun projects while they wait patiently for that little seed to pop out of the ground. Part of being patient is finding other things to do while you wait. Linking up at the these great parties! « Journal Learning Journey: Does God Really Know Me? What wonderful tips and I especially loved the spoon markers with the pictures by the children themselves. I am so looking forward to springtime and getting out into the garden again! Such fun! I enjoyed your blog! Great tips! Spring is just around the corner. Thanks for sharing at the Inspiration Spotlight party. Pinned & shared. Great tips! Gardening with my kids always includes “Don’t step on the plants!” Several thousand times. But we do it anyway. I tweeted, thanks for sharing on the Homestead Blog Hop! LOL that is hilarious…but oh so true isn’t it!! Thanks for stopping by! Love this! I was hoping our three year old would be more into helping out with the gardening and chicken care than she has been, but that’s ok. I think as she gets older and she sees us doing it all the time she will want to help more. Great tips! Hi Alicia! I’m so glad you found some fun ideas to get your little one interested in gardening 🙂 3 is still pretty young to hold attention, BUT maybe with their own little tools and some of these fun little projects, they’ll become a true gardener. Just a little encouragement…sometimes we don’t see the fruit of the “seeds” we plant for a couple of years! So keep just being a wonderful Mom and you’ll reap the rewards! Thanks so much for stopping by. Blessings!